MEADOWROCK IS CLOSING both the FARM and the STORE at the end of this year. Yes, Jim and Barbara are retiring (once again!). 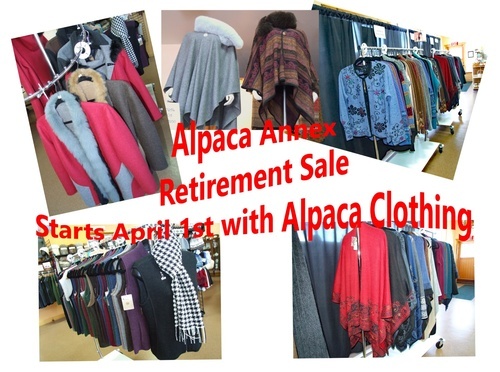 In light of this, different alpaca items will go on sale as the year progresses. Starting April 1st the following clothing items are DISCOUNTED 25%: CAPES, CARDIGANS, COATS, JACKETS, RUANAS, SHAWLS, SWEATERS, AND VESTS. All items are limited to inventory on hand. We are not receiving any more items so once an item is gone, no more of that item will be offered. Shop early for the best selection. All sales final. NOTE: This is the last year to learn about the alpacas’ history, care, and use during our world-famous educational tour. If you haven’t been, it’s well worth the $7.50, children under 5 are free. Tours are given at 10:30 am and 2 pm. We are CLOSED every Monday and Tuesday. Questions: call 395-2266 or email msmeadowrock@gmail.com or visit our website at www.meadowrockalpacas.com to book your tour. Tours at 10:30 am and 2 pm, book online.